Leaving last loop on hook work 1dc into each of next 2dc, yrh and pull through all loops. COAT - Worked in one piece starting with yoke. Make 49ch, 1tr into 4th ch from hook, 1tr into each ch to end (46tr + 3ch). Turn. * rpt from * to * to 3ch to turn with, 1tr into top of 3ch, (57tr + 3ch). Turn. Row 3 - 3ch, 1tr into each tr to end. Turn. Row 5 - Rpt Row 3. Row 6 - (Inc Row) 3ch, 1tr into next tr, * 2tr into next tr, 1tr into each of next 2tr * rpt from * to * to last 2tr and 3ch to turn with, 2tr into next tr, 1tr into last tr, 1tr into top of 3ch. Turn. Fasten off. (101tr + 3ch). Next Row - 1ch, 1dc into base of 1ch, * 1 shell into next shell, 1dc into the space between shells, * rpt from * to * to end, working last dc into top of 3ch. Turn. Fasten off. Row One - 3ch, 1 shell into each shell to end, 1tr into top of 3ch. Turn. Row Two - 1ch, 1dc into base of 1ch, * 1 shell into next shell, 1dc into the space between shells, * rpt from * to * to end, 1dc into top of 3ch. Turn. Rpt Rows One & Two (alternating colours after each repeat) until work measures approx 9.5 Inches from shoulder, ending on colour 2. Fasten off. Sleeves x 2 - With RS facing, rejoin colour 1 to dc before first shell, make 3ch, work 1 shell into each of next 6 shells to opposite side of armhole, 1tr into next dc, ss to top of 3ch on beginning of row. Turn. (6 shells). We will close gaps under armholes later. Next Row - 1ch, 1dc into base of 1ch, * 1 shell into next shell, 1dc into the space between shells, * rpt from * to * to end, ss to first dc. Turn. Starting with colour 2 rpt Pattern Rows One & Two 3 times, (alternating colours after each repeat), ss and turn at the end of each row (sleeve seam should measure approx 4 Inches) ending on colour 2. Turn. Fasten off. Starting with 1ch, 1dc into base of 1ch, work 1 row of 1dc into each st to end, ss to first dc. Turn. Starting with 1ch, 1dc into base of 1ch, work 1 row of 1dc into each dc to end, ss to first dc. Fasten off. Button/Buttonhole Bands - Starting with RS facing, rejoin colour 1 at lower edge on right front, work 33dc evenly along first front edge to corner, 3dc into corner, work 1dc into each tr around neck edge to next corner, 3dc into corner, 33dc evenly along second front edge to corner, 3dc into corner, working along bottom edge work * 1dc into each of next 2tr, miss 1ch space, 1dc into each of next 2tr, 1htr into next dc, * rpt from * to * to last shell, 1dc into each of next 2tr, miss 1ch space, 1dc into each of next 2tr, 1dc into corner, ss to first dc. Turn. Next Row - 1ch, 1dc into base of 1ch, 1dc into each stitch along bottom of coat, 3dc into corner, 1dc into each dc up front edge to corner, 1dc into corner. Turn. Starting with 1ch 1dc into base of 1ch, work 1dc into each dc to corner, 3dc into corner, 1dc into each dc along bottom of coat to next corner, 3dc into corner, 1dc into each of next 21dc, * make 2ch, miss 1dc, 1dc into each of next 5dc, * rpt from * to * once, make 2ch, miss 1dc, 1dc into last dc. Turn. Starting with 1ch, 1dc into base of 1ch, work 1 row of 1dc into each dc and 2ch space to corner, 1dc into corner, ss to first dc. Fasten off. Finishing - Close gaps under arms with needle and yarn, weave in and trim off all loose ends of yarn. Sew on buttons to correspond with buttonholes. thread chain tie through alternate tr's on yoke and tie in a bow. 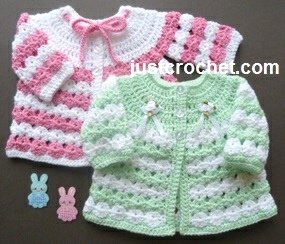 Hope you enjoy this free baby crochet pattern for a newborn coat.